The AML M7170 has been discontinued. No direct replacement is available. 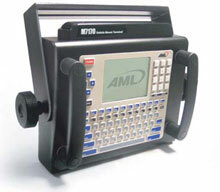 The AML M7170 Vehicle Mount Terminal integrates easily and quickly into a wide range of computing environments. Each M7170 ships pre-loaded with VT100/220 terminal emulation, a TELNET client, FTP server, and an HTTP server. Optional software tools provide support for Windows ODBC and OLE DB data sources, C++ development under Linux, or 3270 and 5250 terminal emulation. As a member of the AML M7100 family of wireless terminals, the M7170 rapidly integrates into wireless data collection applications where AML M7100 handheld terminals and AML M7140 programmable stationary terminals are deployed. A wireless 802.11b connection is standard along with 32 MB of DRAM and 16 MB of Flash ROM. Vehicle Mount charging cradle. Includes cigarette-style adapter which can be either plugged in or cut and hardwired to forklift battery. Compatible with M5900, M7220, M7225, M7500, M7221, M71V2. Includes cigarette-style adapter which can be either plugged in or cut and hardwired to forklift battery.